We are blessed to be on staff at UBC! We are grateful to God for our roles here, enjoy working together as a team, and love serving alongside the numerous UBC volunteers. There are so many of them, and they give so much! 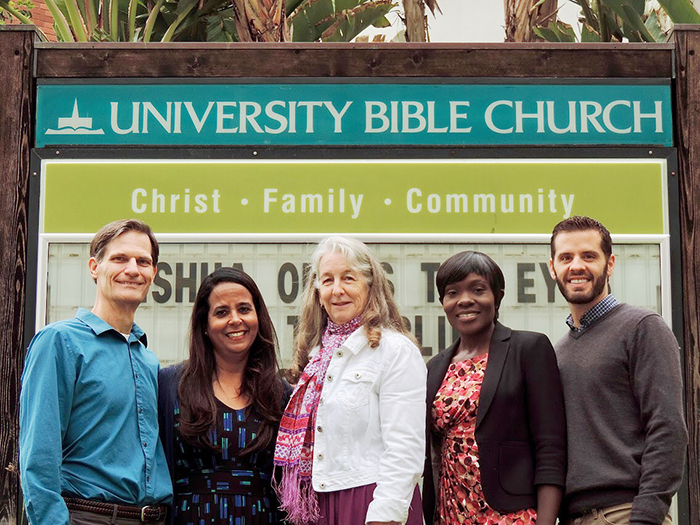 A third generation Angeleno, Bryan Moselle joined the pastoral ministry team at University Bible church in February 2016. Bryan came to faith in Jesus Christ at a young age through conviction that the Bible he was reading was the truth. Since 2006 he has held various ministry and managerial positions in local churches and overseas with Samaritan’s Purse International Relief. He has nearly a decade of experience working in international missions in 11 countries in Africa and was a former Lieutenant in the United States Air Force. He met his Kenyan wife Anne while working in ministry in Nairobi, Kenya, and together they are blessed with four children: Joshua, Imani, Hannah, and Richard. Bryan is a graduate of the University of Pretoria (Ph.D.), and Talbot School of Theology, Biola University (Th.M., M.Div.). He loves spending time with his family, wrestling with his kids, surfing, and Tito’s Tacos. What brought you to UBC? What I love about UBC is the faithful teaching of the Scriptures and the fun and friendly family atmosphere that our church creates. Starbucks, Coffee Bean or Peet’s? Things you miss about living in other places? The Kenyan coast, South African Biltong, and my wife’s family in Nairobi. What are your favorite books or authors? There are 66 of “favorite books” and 40 or so authors. As a WLA native, Kevin first heard the gospel and received Christ when he was 15. He graduated with a Bachelor’s degree in Finance and worked in various corporate positions while often investing his spare time studying the Bible. Kevin attended the School of Ministry at Calvary Chapel Costa Mesa and became a Pastoral Assistant. He has since volunteered in various churches as Children’s Ministry Director, Youth Director, and Evangelism and Outreach Director. He has trained evangelism teams and taught numerous Bible classes, home fellowships, and workshops for teachers at various Calvary Chapel Children’s Ministry Conferences. He has been a part of the UBC family since 2013 and has served as an Elder, Evangelism and Missions Team Leader, and Bible Teacher. Kevin now serves as full-time Family Ministries Director and oversees the Children, Youth, and Family Programs. He is currently attending Talbot Seminary to earn his MA in Theology. He strongly believes that God has called the church to be one family that shares the love of Christ with one another. Kevin met his wife, Yvette in church as she served in Children’s Ministry. She has served alongside him in ministry for many years and also loves kids, youth, and evangelism. They have been married for 15 years and are raising their 10 year old daughter, Hannah who loves creative writing, swimming, and playing the flute and the piano. I really felt a sense of family and warmth from the many people we met here and so appreciated the Children’s Ministry and the solid Bible teaching. Beach, though I do love the mountains and skiing. Where is the best place you’ve ever traveled to? Tahiti for its beauty and Israel for its heritage. Where is the most unusual place you’ve ever traveled to? There are 66 of my “favorite books” and about 40 authors. I grew up here in Los Angeles as a native. I rededicated my life to Christ in May of 1985 after attending University Bible church with my soon-to-be husband Pat. I’ve been attending and worshiping here for all those years since. I raised my children in this church and consider the people here to be my family. I enjoy helping people, meeting new people, and feeding people. I took the job of church secretary in 2009, and have taken on many other jobs in the church since then. I enjoy serving the Lord here and plan on doing so as long as I am able! I like to cook and I have my own catering business. This would be a very close tie but I guess the beach would win out. Tahiti, on my honeymoon – it was beautiful! What’s the most fun thing you’ve done in LA? One of the most fun things I have done is to ride in a helicopter over to Catalina Island. Pictured from left to right: Family Ministries Director, Kevin Campbell, Yvette Campbell, Office Administrator, Jane Qualey, Anne Moselle and Senior Pastor Bryan Moselle.